Do you love clean, fruity aromas? Create a fresh and unforgettable atmosphere in your home with the luxury scent of the Parks Pomegranate Diffuser. Fruity and colourful, zingy and vibrant, this is an energising, true-to-life scent both family and guests are sure to love. Expertly blended using the finest ingredients and a 100% natural base, this invigorating fragrance will lift your mood effortlessly. If you are searching for a modern fragrance for your home, this is it. This incredible scent is perfect for adding a welcoming touch to any room, from hallways and dining rooms to bathrooms and bedrooms. You won’t believe how fresh and true-to-life the aroma is – we’re sure you’ll agree that we have perfectly captured the essence of this exotic fruit. Savour the sweetness of freshly juiced pomegranates as the slow-evaporating diffuser oil lightly scents the air. 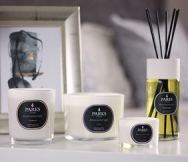 Created by our very own skilled perfumer, Parks Home Diffusers are made using the finest ingredients, specially designed to evaporate slowly and last longer. You won’t find a diffuser that offers a better and more lasting effect. For over 20 years, Parks London has been famed for refined signature scents and aromas. From the popular Parks Home Fragrances collection, this Pomegranate Diffuser contains 100ml of a blend of fragrance and essential oils, offering up to six weeks of beautiful fragrance. The diffuser is packaged in a luxury presentation box, complete with natural rattan sticks, making it the ideal gift for friends and loved ones.